After you watch all of Buster's "own" work -- that amazing hunk of film over which he had artistic control and which rightfully establishes him as a silent genius -- and there's nothing left in the well, you will be understandably sad. But, take heart, you're in luck. There are a dozen short comedy collaborations he made with Fatty Arbuckle that you can drown your sorrows with. Though not anywhere as clever as Buster's own work, these films are still uniformly solid, fun and enjoyable. Unfortunately once you've exhausted those -- and you still need more Keaton -- there's nothing else to do but to plunge forward into the MGM-era work. And that, friends, is just what I've been doing. The MGM films start off auspiciously enough with The Cameraman, still bearing his unmistakable artistic stamp. In fact, many Keaton fans consider it his finest work; it enjoys a lovely polished feel that blends superbly with his signature physical comedy to create a masterwork. But unfortunately, just after making that film, Buster's ability to control the details of his movies fell off sharply and the films that followed are serious disappointments for his modern fans. They are just not in the same league as his earlier work. Watching them causes a certain internal struggle as the desire for more Keaton clashes hotly with the trauma of lost potential. Spite Marriage, which followed The Cameraman, was Buster's last silent film of the era and was released in April of 1929 when the movies were undergoing a massive upheaval. It is important to note that backdrop because it frames one's expectations for movies of this timeframe. The advent of sound created crazed changes for the industry that are hard to understand without immersing yourself in the time period. As anyone reading this is probably already aware, around 1927, especially with the release of The Jazz Singer, the technological advances necessary to adding a synchronized audio to films had begun to change the industry. Although the public was ravenous to "hear" the movies they were seeing, adding sound to films was not as simple as flipping on the sound switch. Everything about how films were being produced needed to change to accommodate sound filming -- cameras were no longer as mobile as they had been, microphone placement became important, acting styles shifted to take into account speech as a way to emote, ambient background sounds started to matter, and most of all, comedy was changing too. Because the public was heady for new things, the style of comedy associated with silent films -- physical, visual comedy -- began to give way to dialog comedy. I do believe that it is that change -- the change in comedy style -- not the fact of sound per se, and not even the change from his own studio to that of MGM, that caused Keaton's career to suffer the most. The loss of public interest in the style of comedy Keaton was a genius at was a huge barrier to his success in this "transition era." The changes in Hollywood were huge, and so were the changes in the world at large. Keep in mind that the transition from silent to sound was happening on the threshold of the stock market crash and great depression. In larger social context, the era is one of many upheavals. I say all this by way of noting how massively Spite Marriage has already shifted from Keaton's brilliant Steamboat Bill Jr. (from the prior year) or even from The Cameraman, made just a few months before. Spite Marriage is and feels like a "transition era" film. Unpleasant in the same awkward teenage way other films being produced at this time were, this is not entirely a silent film -- there are synchronized sound effects and a music track. However, the sound effects are grating. We don't need comic sounds to underscore that Buster is doing something funny. Whoops, whizzes, zips, and tweets are just stupid when the comedy speaks for itself. So, no, this film does not have an exceptional story, but it is still exceptional in that it has a great deal of Buster in it. Some of his scenes are laugh-aloud funny (such as where he puts on the stage whiskers, or, of course, the famous putting the drunk wife to bed scene). There is also a short scene where Buster is being chased by cops, that is not only excellent, but bittersweet. Fans of his earlier work will remember what he can do when allowed to let loose and feel twinges of regret that we will not see it again. These same vignettes of memory may strike you during his scenes on the boat. It is exhilarating to see Keaton in his element on his beloved boats. . . but sad to know that the physically powerful Keaton -- the in control, zen-like Keaton -- has left us for good. 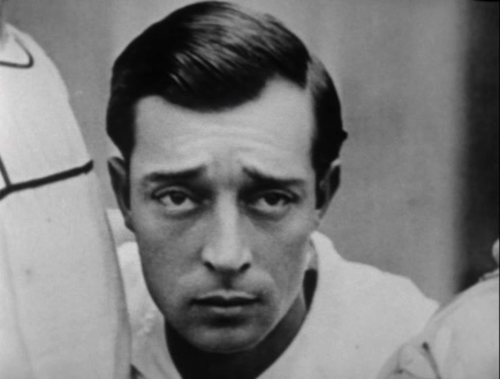 This film inspires another set of musings for me, this time with the idea of Buster's image. Here, he looks so much more like a man than he does in his own films. He is in his mid-30s, and for the first time actually appears to be a grown up. It makes me wonder how Buster might have milked his own changing look for more and different laughs had he been able to stay in control of his image. Unfortunately, he gets held in a child-like limbo, ratcheted down to a dumber version of his younger self, hijacked by the Elmer persona (his character here, played for the first time and blessedly without dialog.). Slowly, over the next half-dozen MGM films, Keaton's persona, image and style morph into something almost unrecognizable from the peaceful intelligent matter-of-fact likeableness of his earlier style. MGM films have missed the point of Buster's genius. The smart viewer knows, as Keaton knew, that it's pathetic to laugh at a fool who doesn't have a clue. Buster was never funny, amazing and interesting because he was a bumbling fool. He was wonderful because he sat on that ironic edge -- between someone who appeared to be a loser, but who was actually in supreme control of his world. spite marriage is my favorite because some of the gag and stunts are great I wish that MGM made it in to talkie. Spite Marriage is a movie I dislike more and more every time I revisit it. Upon initial viewing, I liked it, but now, I find it so lacking, mean-spirited, and structurally unstable that I hardly enjoy it. I like Dorothy Sebastian's nasty actress character just because she's delightfully selfish and the drunk bride sequence, but the rest just does not gel, at least for me. I probably need to re-watch Spite Marriage to be intelligent about it. I'm sure I haven't seen it since I wrote this post. I feel so conflicted on the MGM films in general. I don't really like any of them, but find things to value in many of them. It is so hard for a Keaton fan to fairly judge them at all. I think Spite Marriage at least had some very good Buster antics in it, though there is no doubt it is the beginning of the end. 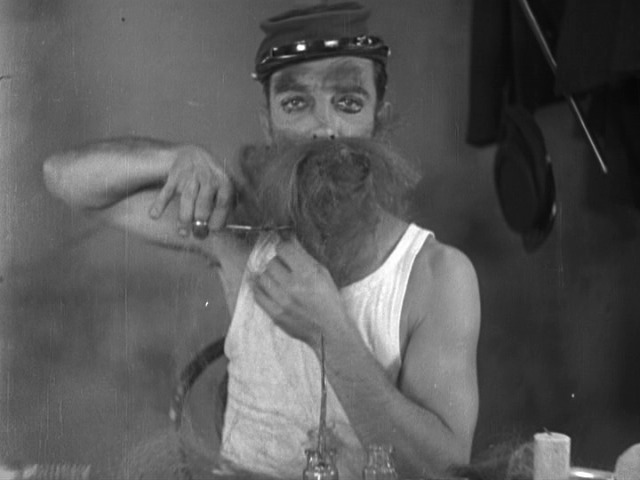 Buster Keaton forever! I really like the Spite Marriage, the Hospitality, the General,and any other B.K.works, his movies are among the best films for me!